Discovery astronauts Rick Mastracchio and Clayton Anderson perform a spacewalk on April 11, 2010, the second of their STS-131 mission, to install a new ammonia coolant tank on the International Space Station. The old, empty ammonia tank they replaced is seen at the end of the station's robotic arm at left. Thisstory was updated at 11:49 a.m. ET. HOUSTON? Two astronauts battled with a stubborn bolt early Sunday while hooking up amassive new ammonia coolant tank outside the International Space Station duringthe second of three spacewalks dedicated to the in-space maintenancechore. Discoveryshuttle astronauts Rick Mastracchio and Clayton Anderson ventured outside thestation?s Quest airlock at 1:30 a.m. EDT (0530 GMT) filled with confidence forwhat turned out to be a 7 1/2-hour service call on the orbiting lab. ?Ithink we're very well prepared,? said Anderson, 51, commenting from orbit aboutthe one day?s rest they had between spacewalks. ?We're in pretty good shape forold men and I think we'll be ready to rock and roll.? It?s the fifth careerspacewalk for both Anderson and Mastracchio, 51. Butthe stuck bolt and snags slowed the new 1,700-pound (771-kg) ammonia tank?sinstallation, as well as the removal of an empty tank that will be returned toDiscovery?s payload bay during the astronauts?third spacewalk on Tuesday. ?Crud, you silly beast. Jiminy Christmas! ?said Anderson, as he got hung up on a lanyard and pin. ?Justgo slow. It?s fine,? replied teacher-astronaut Dorothy ?Dottie? Metcalf frominside Discovery, where she choreographed the work. ?There's no rush." Thespacewalkers ran out of time before they could hook up the fluid lines thattransport liquid ammonia coolant from the tank to the station. They also had todrop some other minor tasks. Thespacewalk drama unfolded on the 40th anniversary of the launch of NASA?s Apollo13 mission to the moon. That mission took an unexpected turn when an oxygentank exploded en route to the moon, crippling the spacecraft and leaving itsthree-man crew in peril. Engineers worked furiously on the ground to rescue theastronauts, successfully returning them to Earth in one of NASA?smost memorable missions. Mastracchioand Anderson said the biggest challenge of today?s work was the choreographybetween man and machine to coordinate when spacewalkers would work on thetanks, and when refrigerator-sized units were grappled by the station?s robotic arm. ?Thebiggest challenge is just the integration of all the robotics,? Mastracchiosaid in an interview Friday. ?It's going to require a lot of teamwork to getthat to work out smoothly.? Discoverymission specialist Stephanie Wilson and pilot Jim Dutton controlled thestation?s arm during the spacewalk. Becauseof the location of the old ammonia tank assembly, the station's robotic armcould not reach it from the same location that it had to be in to remove thenew tank from space shuttle Discovery's payload bay on Friday. That meant thatthe spacewalkers had to unpack and store the new assembly, then come backinside the station while the Canadian-built robotic arm was repositioned. "Youguys are doing great,? said shuttle commander Alan Poindexter. ?It's reallyawesome to see you working." Afterremoving the old ammonia tank assembly, Mastracchio and Anderson temporarilystored it on a tool cart. 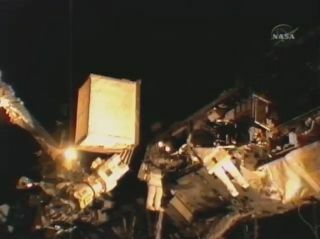 During the third spacewalk, Mastracchio and Andersonwill pack the old assembly into shuttle?s cargo bay for its return to Earth. Thespacewalkers were relieved as soon as the old ammonia tank was grappled by thestation?s robotic arm for its Tuesday move. ?I?mglad to get that out of my hands,? said Mastracchio. ?Oh,you got that right,? Anderson replied. Aftertwo straight spacewalks with ammonia tank difficulties, Metcalf-Lindenburgersaid it was time for the old, empty tank to behave on the third spacewalk. Sunday?sspacewalk was the 142nd dedicated to space station assembly since constructionon the nearly complete $100 billion orbiting lab began in 1998. One morespacewalk is planned for Discovery?s crew on Tuesday. WhileMastracchio and Anderson focused on the spacewalk activities, Japaneseastronaut and ?loadmaster? Naoko Yamazaki will continue overseeing the transferof supplies, equipment and experiments from the Leonardo logistics module thatDiscovery launched and temporarily attached to the station. Sofar, the astronauts are just about halfway through delivering the nearly 17,000pounds (7,711 kg) of science equipment, supplies and other gear to the spacestation. The astronauts also successfully repaired the space station?s waterprocessing assembly, restoring the orbiting lab?s water recycling system,mission managers said. Aspare part launched on Discovery was used to make the water system repair. Discoveryblasted off last Monday and is in the midst of a 14-day flight to theInternational Space Station and due to land in Florida on April 19.